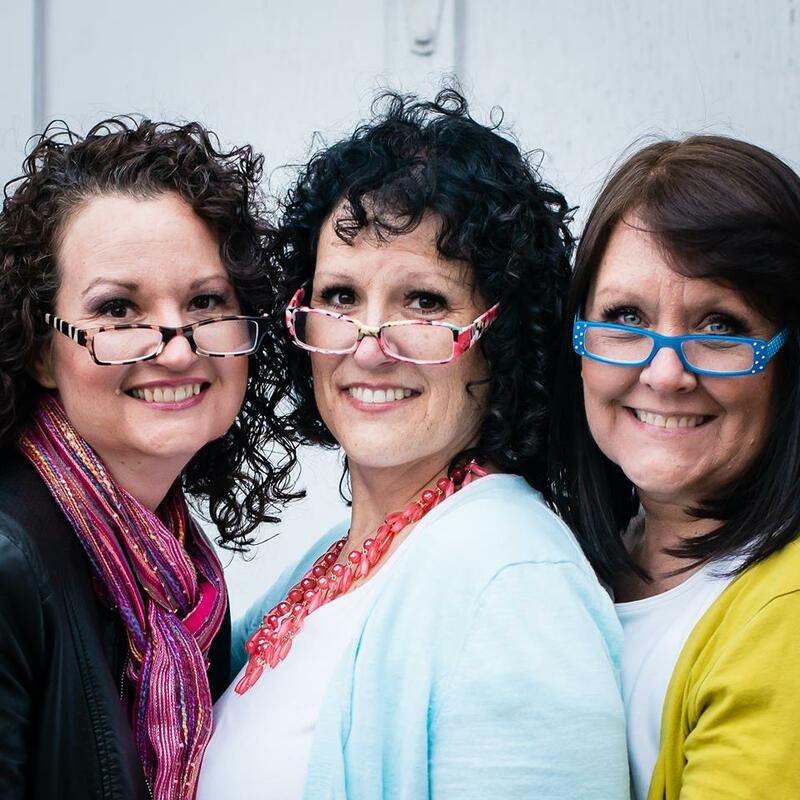 How do people work full-time and prepare for a wedding? My last daughter is getting married on Dec. 22, 2012. Yes you read that right. If you look at the calendar you will realize that this is the Saturday BEFORE CHRISTMAS. Nothing like putting my Christmas season into a tail spin. And needless to say that some of our regular holiday activities will need to be slimmed down a little bit to get ready for her big day. 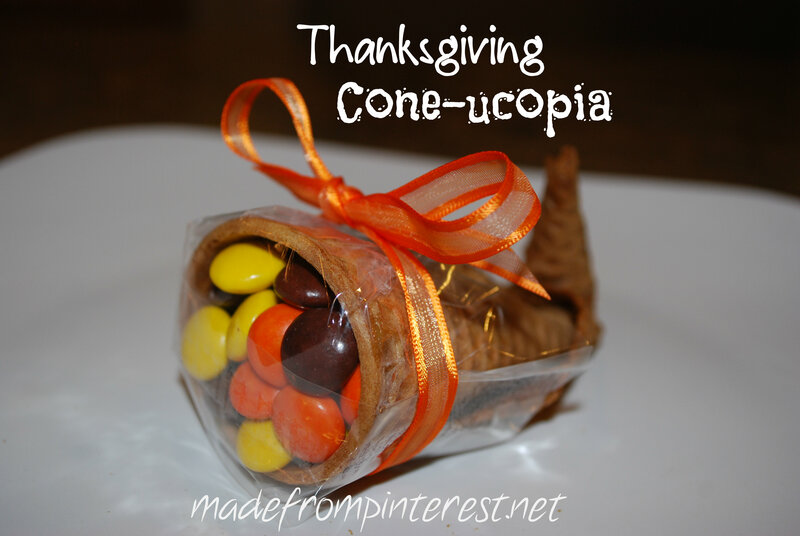 I was looking for a cute, quick little Thanksgiving something for a pre-snack on Thanksgiving Day and found this pin from Dollhouse Bake Shoppe. I have seen variations of this pinned many, many times and this was going to be the perfect thing that I was looking for. But on to the instructions. 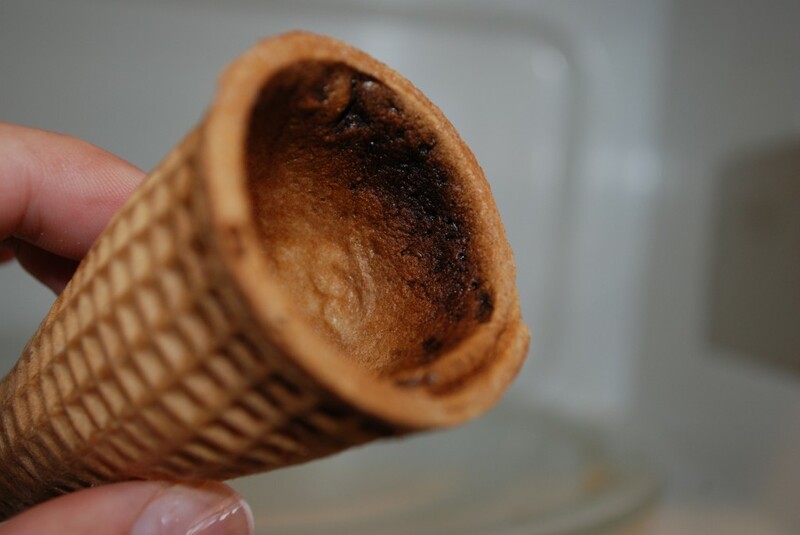 They called for two different ways to soften the sugar cone and I opted for the microwave version as I thought that would be the quickest. Gathering up my supplies, I started off. I am going to give you a sneak preview and let you know that I neglected to read the sentence in the parentheses. Can you tell what’s coming? Lowering my wattage, I microwaved again. But again, the cone didn’t soften real well. So I changed direction and decided to steam the cone as stated in the second option of how to soften the cone. 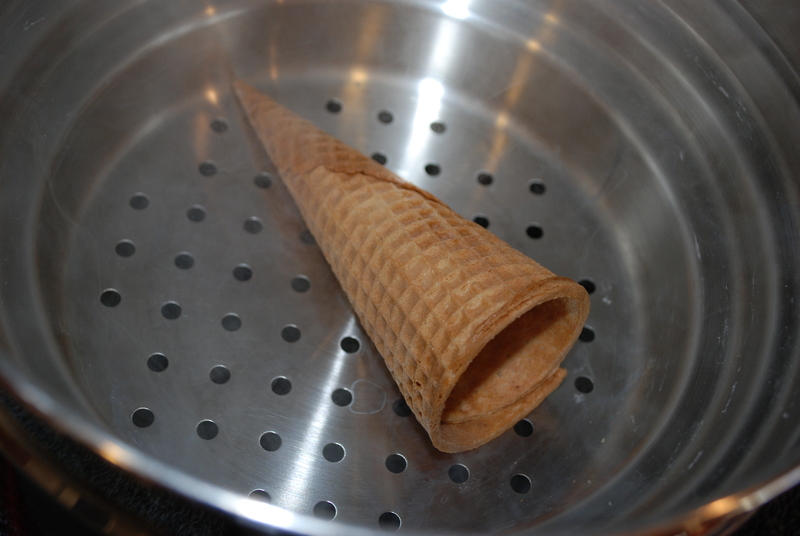 The directions said to place the cone, open side down into a steamer and with the lid OFF steam the cone until softened. This time I made sure to read ALL DIRECTIONS before beginning. So placing my cone, exactly in this position, I attempted to steam my cone. After a few seconds, still a hard cone. Few more seconds, still a hard cone. I was beginning to wonder if I had bought INDUSTRIAL STRENGTH sugar cones! Geezo Peezo! 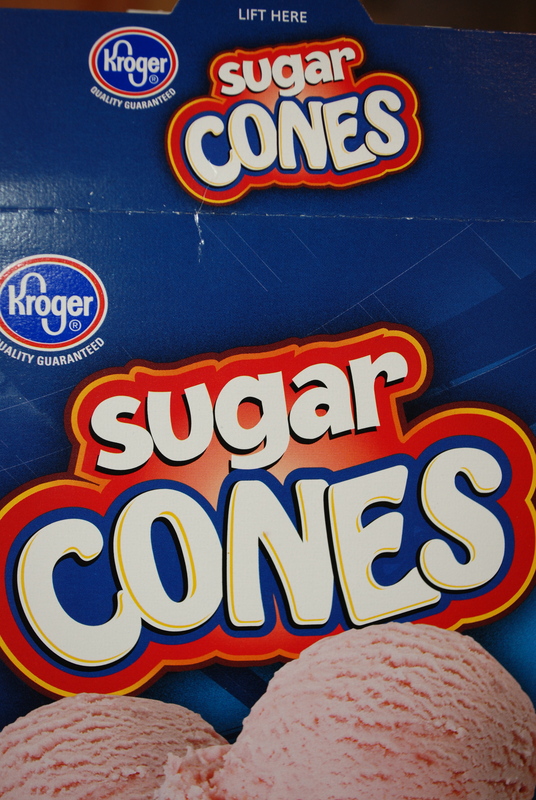 I even checked the box to make sure I had gotten just regular sugar cones. Seriously, I mean how hard could this be? But nope, I had regular sugar cones from Kroger’s. 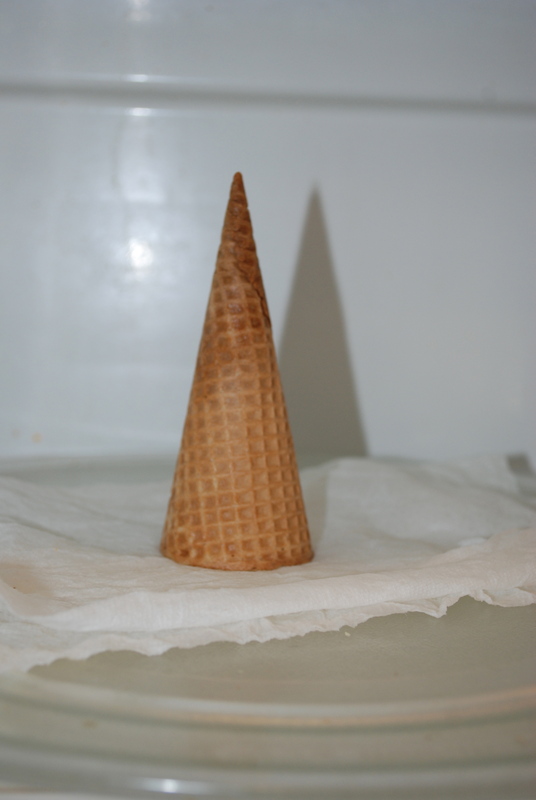 Relieved that I didn’t have sugar cones that could be used to build an armored car, I turned the cone sideways and….don’t tell anyone…..I put the LID ON. Checking after a few seconds…. VICTORY! The cone was soft enough to bend. I held it in place until it cooled down and re-set. Now that I have my Thanksgiving treat all planned out, I’m off to run wedding errands! Here Comes the Bride and Happy Holidays! We are excited to be linking up to these sites today!